Home / Uncategorized / Our fantasy football trophy goes to…. Our fantasy football trophy goes to…. I’m still trying to accept the fact that my buddy Dino and his team, Bologna Pony, won it all last year. The guy probably couldn’t tell you who the starting QB for Miami was at the end of the season and why. It’s the part of fantasy that you gotta hate. A guy can just print up a cheat sheet, show up to the draft, and rattle off a few names, that by some miracle end up being gold by the end of the year, and he wins the whole damn thing. 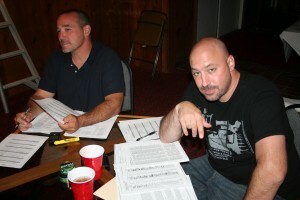 Dino is the guy who knows rounds 1-4 and then turns to his trusted Huddle print out to get him through the rest of the night. What can you do? It happens all across the country. I just pray he isn’t the first guy in the 20 year history of my league to repeat as champ. The league may have to fold! 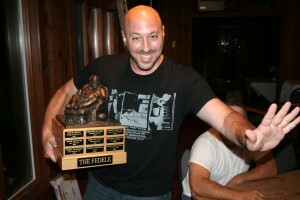 Yes, this guy will be in possession of The Fedele - fantasy football trophy.